﻿ Western Isles - Uist - News - Come and learn with the National Youth Pipe Band of Scotland. Come and learn with the National Youth Pipe Band of Scotland. The National Youth Pipe Band of Scotland is pleased to announce its outreach programme is coming to the Outer Hebrides this Autumn. Bringing its young members to both Stornoway and South Uist to conduct its outreach programme for 2012, the programme will see NYPBoS members help teach and collaborate with other young pipers and drummers by conducting workshops and an evening performance. Membership to the band is drawn from across Scotland’s 32 councils, and young pipers and drummers come from an array of different competing pipe bands and musical backgrounds, brought together as a collection of the very best chosen to play for their country. This is a fantastic opportunity for local pipers and drummers to meet other young musicians from across Scotland. The workshops will take place on Saturday 22nd September at the Nicolson Institute, Stornoway and Sunday 23rd September at St Peters Hall on South Uist. Both workshops will run from 10am-4pm. The National Youth Pipe Band of Scotland will also be doing a performance at each location. The performances will be at the Nicolson Institute, Stornoway on Friday 21st September and St Peters Hall on Sunday 23rd September, both at 7.30pm. 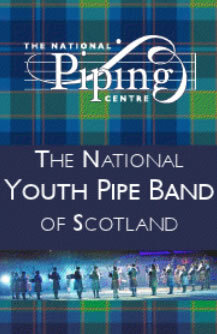 For any young piper or drummer who would like the chance to take part in this fantastic opportunity please contact Alisdair McLaren at the Piping Centre on 0141 353 0220 or email amclaren@thepipingcentre.co.uk or click here for more details.